Notes: This is a spin-off featuring the characters on Tenchi Muyo, in particular, Sasami. This series is double-featured with the Tenchi Muyo: Mihoshi Special in the North American DVD release. Ten-year-old Kawai Sasami lives with her older brother Tenchi and her mother Chihiro in their family-owned CD shop. One day, Sasami was forced to deliver a CD to a seemingly deserted house, and inside found a candidate for future queen of Juraihelm: Tsunami. She gives Sasami a magical baton and an obligatory magical girl mascot (TM), Ryo-Ohki (who's a talking boy in this series). With the baton, Sasami can turn into Pretty Sammy, and protect Japan from the attacks of an evil magical girl running amuck recently: Pixy Misa, who is actually Sasami's friend, Misao, turned evil by Ramia. She, too, wants to be queen of Jurai, and refuses to let Tsunami become queen. As a big fan of Magical Project S (I saw it all prior to watching this), I figured I'd be the perfect candidate to watch the OAV series that preceded the TV series I liked so much. 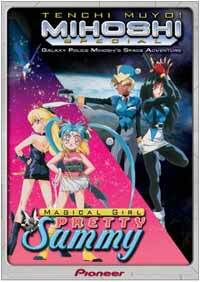 To help support the belief that I'd like it, I read a whole bunch of positive reviews of Magical Girl Pretty Sammy prior to getting my sister to but it on DVD: we thought we'd like it just as much as the TV series. So one Sunday, my sister picked up the Pretty Sammy/Mihoshi Special DVD, and when we came home that night we watched it. The verdict? It's nowhere near as good as the later television series. One of the biggest problems I noticed was the format with the show. Why bother introducing all these ideas and concepts if you're only going to make it three episodes long? It's like trying to condense War and Peace into a hour-long television special. This wouldn't be too bad if they want all out with skewering the magical girl genre, but it starts off in the same exact magical girl series format of spending a entire episode just introducing everyone. The first episode is basically a long introduction that just so happens to have a Monster of the Day battle tossed into it, what with the explaining about Sasami becoming Pretty Sammy, that both Tsunami and Ramia want to become queen of Jurai, and that Sasami's best friend Misao becomes the evil Pixy Misa through Rumiya (Ramia's little brother). Fortunately, things get better in episode 2 (the best in the bunch), with a plot about a Bill Gates look-alike teaming up with Pixy Misa to conquer Akihabara with his own computers, leading to a lot of fun skewering of Microsoft (as well as computers in general) in the process. Sadly, the third (and thankfully final) episode is the worst in the bunch, which revolves around Sasami having a crush on someone who looks almost exactly like her older brother (AGH! ), only to say good-bye to him at the end of the episode...then that's it. No final battle, no resolution, and no point. The battle scenes with Pretty Sammy and Pixy Misa are the only highlights of the series, and they only last for a few minutes each OAV. Very disappointing. Also disappointing is the way the the rest of the Tenchi Muyo cast other than Sasami are used as supporting characters, acting far more stupid (and shallow) than they ever did in the original OAV. Most of the side antics are regulated to Ryoko and Ayeka, who attend the same high school as Tenchi and keep constantly trying to take him away from one another. Ryoko provides a few laughs here and there, but otherwise these segments are just unnecessary filler, and again the Ryoko/Ayeka bickering was better in Tenchi Muyo! Ryo-Ohki. It's almost as if AIC slapped together any flimsy script they could, hired the standard Tenchi cast to voice the dialogue, and sold it to market. And it looks that way, too: the animation and art are sub-par for an OAV series. Not quite as bad as Tenchi in Tokyo, but still pretty bad. Audio-wise, the same voice cast from the older Tenchi series is here, and they even re-use music from Ryo-Ohki! The new cast members are likable enough new additions to the already-crowded Tenchi universe (I found Ramia to be a very funny "villain", and Pixy Misa's random use of English was always good for a laugh), and their Japanese voice actors do the best job they can with the flimsy material they got. Too bad the dub doesn't follow this principle: all the new voices are pretty bad, with Misao's English actress even being replaced after the first episode! And I still think of Jimmy Neutron whenever I hear Ryo-Ohki's dub voice (they're the same actress. Seriously). 2.) Very forgiving magical girl fans. If you're not in one of these two categories, you can safely ignore this mediocre OAV. You'll thank me later for saving you 100 minutes of your time. Recommended Audience: Well, Ryoko's here, as is Mihoshi, so you can expect fan service (though it's very light compared to Tenchi Muyo! Ryo-Ohki), along with the occasional, bloodless violence resulting from stuff being blown up and monsters being defeated by Engrish-sounding attacks.